I sometimes joke because I write in both the romance and fantasy genres that there is very little difference between the two, especially the way that I write it. After all, I love to write exotic locations, interesting professions, and whirlwind romance, things that we generally don’t association with our own day to day lives. But here’s the secret. A huge portion of the details in Five Days in Skye were taken from my own life. I’ve talked about the inspiration for some of the characters and the storyline in other blog posts, but here’s what I haven’t told anyone: I always put bits of my own hunky hubby in every hero I write. 1) I like to write foreign heroes with big crazy families, because I married one. My husband is originally from the Philippines and came to the United States in his early twenties. Yes, he has an accent. Yes, I really dug the fact that he was well-traveled and loved all sorts of food from around the world. And he came along with a big, extended, warm, welcoming, and fairly insane family. 2) All my heroes speak foreign languages (sometimes multiple ones) because my husband does too. James speaks a little Scots-Gaelic because his aunt does, but he also speaks French, which is typical of a British public school education. My hubs’ native language is Tagalog, but he also speaks English and Spanish, and understands two other Filipino dialects reasonably well. I’m always so impressed and jealous by his language skills that I give that trait to my leading men. 3) I always write athletic men because it’s one of the traits I love most about my husband. A lot of my friends know that the hubs and I met in a martial arts studio. I was a new student, he was one of the assistant instructors. In the sixteen years we’ve known each other, he’s trained multiple days a week except for the year we made our big move from California to Colorado. (It took a while to find a new school.) So all of my heroes have some sort of athletic pursuit. For James it was running. For James’s brother Ian (who will be the hero of my next romance) it is rowing. I even have a martial artist leading man as an homage to my own guy. And come on, girls, let’s be honest… as much as we love sensitive, caring, and supportive guys, we still like muscles. 4) I know a whirlwind romance can lead to lasting love because I had one. As you can see, here’s a reason why I dedicated the book to my husband… he inspired so much of it! So now it’s your turn to tell me below in the comments. What bit of romance in your real life is worthy to be put on the page? I love *love*. And I love women who truly love their husbands – that’s so wonderful! Love, love, LOVE this post, Carla! Our guys should be our own leading men. If you know anything about my debut novel, then you know how true that is for me personally. :) Several of my relatives have shown up in my books, as a matter of fact, as well as the names of a few of my readers. It’s such a hoot when they read a book and realize, “Hey, is she writing about me?” Always in a flattering way, of course. I love everything Italian, and so the hero of my latest Christmas novella is a man I affectionately call my Italian Cowboy. Yeah, he’s a pro soccer player. I like them athletic and hunky, but with a certain sensitivity to go along with those broad, strong shoulders. And meeting in an unexpected place? A whirlwind romance? It can definitely happen (for all the naysayers out there), and be a forever romance. You and your hubby are living proof! :) Thanks for sharing your story. Blessings! Okay – I just love you ten times MORE now, Carla! This story was FANTASTIC – and are your leading men ;-) Whew…definitely swoon-worthy, but it comes from great inspiration, I see :-) Foreign? Big families? Sigh…you’re definitely a kindred spirit, girl! And aren’t whirlwind romances fantastic! LOVE! You just made me want to go home and kiss on my man!! YES!!! Ours was instant hate that grew into forever love. Athletic is YUMMY, btw. Eat ’em up. GOSH! Love this post. Ha! Love that. Hate that grew into forever love… that’s a story in the making for sure! Carla, I like how you’ve put so much of your husband into your stories. That’s so neat! Reckon he feels pretty special. Putting romance on the page is a tricky thing for me. I haven’t yet met my husband-to-be. (All in God’s time, I know.) So, I look at relationships around me. Those of my parents, friends, and strangers in Walmart. Those that have succeeded AND those that have broken apart. 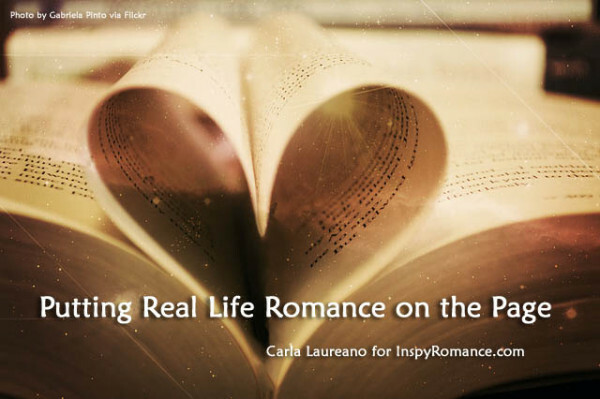 Romances from real life and from books and movies I like (and don’t like!). I don’t intentionally include things from any particular couple, though. I build a romance area in my mind where I can dig out what I need when I’m writing the romances of my own stories. The people who have read my stories haven’t said anything about the romance not seeming realistic. Guess my observation skills are pretty good. Sounds like you AND your hubs have been a blessing to each other! Such a fun post! Carla..I loved your book Five Days In Skye. Congratulations on being a finalist in two categories in the RWA Rita AWARDS. Thank you for explaining that your book fits into the edgy contemporary inspirational category. Both you and Halle Bridgeman have similar styles in writing. I noticed she commented earlier. You two need to get together sometime! Do you have plans on releasing another book in this category?